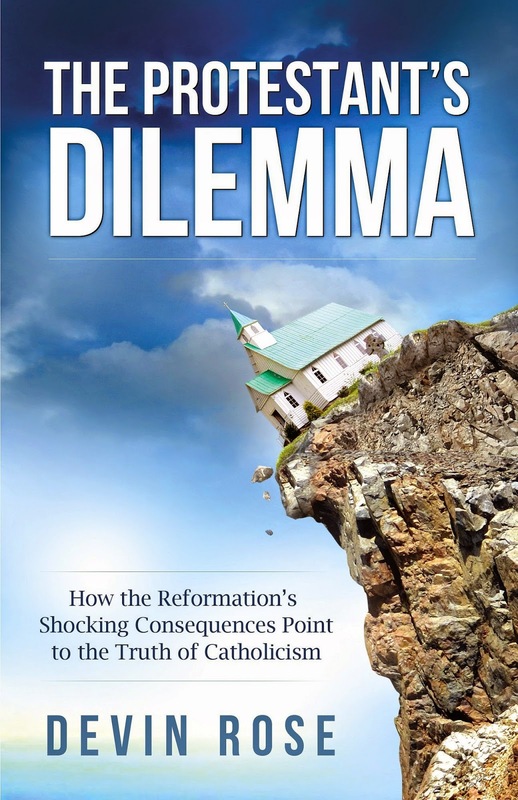 This is a continuation of my review of The Protestant’s Dilemma: How the Reformation’s Shocking Consequences Point to the Truth of Catholicism (San Diego: Catholic Answers Press, 2014, Kindle edition) by Rome's defender, Devin Rose. The book throughout presents caricatures of Protestant positions, illogical conclusions, shoddy documentation, assumes the truth of the Roman Catholic worldview without proving it, and demonstrates that the author did not apply his own criteria to his own position. Section 2 of TPD is entitled, "The Papacy." It's a short chapter, under 1000 words. The temptation in reviewing it is is to respond at a much greater length, but for the sake of the same brevity, I'd like to focus on it as an example of assuming a Roman Catholic historical paradigm without proving it. Based on these unproven assumptions, TPD sets up another straw-man to knock down. If the papacy existed from the beginning, then logically for Protestants, "sometime between the first centuries of the Church and the Protestant Reformation in the 1500s, the papacy as an office must have become corrupted, and God revoked his authority from it." TPD says that "An unbiased examination of the historical evidence, coupled with Peter’s words in his first epistle, make an overwhelming case for the first bishop of Rome being Peter and the line continuing in unbroken succession," yet the book only provides a surface-level biased interpretation of the evidence. It offers no counter-evidence to its claims, nor does it appear to function with an understanding of the difference between an interpretation of the facts and the facts themselves. The section begins boldly stating, "The Church had a pope, a visible head, from the beginning." TPD simply assumes there was a monarchical episcopacy functioning in Rome "all the way back" without proving it. In order for any of TPD's claims to be true in this section, this fact would have to have been established from the outset. It isn't. For instance, we see this glaring factual omission in TPD's treatment of 1 Clement: "Clement begins the letter by stating that he writes from the church in Rome, strengthening the claim that this line of bishops dwelled in Rome and was begun by Peter." The letter being referred to doesn't identity its author. Rather, the letter says it's from "The Church of God which sojourneth in Rome to the Church of God which sojourneth in Corinth." There is not any sort of historical consensus that there was a monarchical episopate functioning in Rome at the time this letter was penned. Rather, this letter serves just as well as evidence that the church of Rome was led by a body of presbyters [see: Lampe, Peter. From Paul to Valentinus: Christians at Rome in the First Two Centuries Trans., Michael Steinhauser Ed., Marshall G. Johnson (Minneapolis: Fortress Press, 2003]. TPD assumes that in 1 Peter 5:13 "Babylon" means "Rome," concluding Peter wrote from Rome, therefore he established the Roman church. Granted, TPD says "the Bible does not explicitly say 'Peter was the bishop of Rome.'" Rather for TPD, 1 Peter 5:13 is only "biblical evidence for the claim." But It's debatable whether or not "Babylon" means "Rome." 1 Peter 5:13 is the only shred of Biblical inferring evidence that TPD has proving Peter was the first pope of the Roman Catholic Church. The historical information given by Luke documents Peter’s ministry in Palestine and Syria. When Paul wrote to the Roman Church, there is not even a hint or allusion to Peter being its bishop. Similarly in the epistles written by Paul from Rome, any information linking Peter to Rome is absent. Here's TDP's Peter: the visible head of the Roman Catholic Church, with only one word of biblical support to prove it: the code word "Babylon." I'm reminded of Adam Clarke's old comment, "It's true that all the ancient ecclesiastical writers have ascribed to the word Babylon a mystical meaning; for though the Greek and Latin fathers commonly understood Rome, yet the Syriac and Arabic writers understood it literally, as denoting a town in the east; and if we are to be guided by opinion, an oriental writer is surely as good authority, on the present question, as a European." TPD simply assumes Peter founded the church in Rome because he went there. On the one hand it presents evidence to prove "Peter was in Rome and established a church," and then a paragraph later states "Irenaeus spoke of the church in Rome founded by the apostles Peter and Paul." Which is it? I'll assume Mr. Rose will claim both are true. Whichever it is, the historical waters are quite murky for Rome's defenders in regard to Peter's physical presence in Rome. One tradition posits that Peter and Paul established the Roman Church in the early 40’s. Peter is said to have remained in Rome for twenty-five years, preaching the Gospel, and eventually writing the epistles of 1 and 2 Peter. Some versions of this twenty-five year period include Peter’s travels, with Rome serving as his “home base” when he wasn't on missionary trips or attending church councils. Other versions have Peter going to Rome shortly after the Jerusalem council in 49 AD, and then returning to Rome just prior to 60 AD. Yet another version has Peter going to Rome one time only: towards the end of life during Nero’s reign. It depends on which defender of Rome one is dealing with as to which version is utilized. Catholic Answers posits that "if Peter never made it to the capital, he still could have been the first pope, since one of his successors could have been the first holder of that office to settle in Rome." On the other hand, the Catholic Encyclopedia sees it as essential for Peter to be in Rome at some point: "The essential fact is that Peter died at Rome: this constitutes the historical foundation of the claim of the Bishops of Rome to the Apostolic Primacy of Peter." Yet for TPD, the reader is to trust that Mr. Rose is presenting an unbiased look at the facts. Some Protestants have looked at the same facts and have concluded that Peter may not have gone to Rome at all. Perhaps what Mr. Rose should have sought to provide is a fair accounting of differing interpretations rather than his own biased conclusions. TPD states, "we know the names and approximate dates of all of the popes, all the way back to the first century." The Problem of the Anti-Popes. Another riddle of Roman Catholicism is the scandalous specter of having more than one infallible pope at the same time—a pope and an anti-pope. The Oxford Dictionary of the Christian Church says “there have been about thirty-five anti-popes in the history of the Church.” How can there be two infallible and opposing popes at the same time? Which is the true pope? Since there is no infallible list of popes or even an infallible way to determine who is the infallible pope, the system has a serious logical problem. Further, this difficulty has had several actual historical manifestations which bring into focus the whole question of an infallible pope. Geisler, N. L., and MacKenzie, R. E. (1995). Roman Catholics and Evangelicals: agreements and differences (p. 217). Grand Rapids, MI: Baker Books. @guy fawkes "NO reputable historian questions Peter being in Rome." As I understand it, the tradition of the Assyrian church is that Peter died in Babylon (the real Babylon, not Rome). I mean, who's to say it's wrong? Yes there is a strong tradition he died in Rome, but that is just one of several competing theories, no? @guy fawkes, well hang on now. If Peter did die in Babylon, then the pope in Rome isn't the successor of Peter, then you can't rely on the pronouncement of Rome to determine that the Assyrian church had christological problems. You'll have to prove that on some other basis first. What is that basis? And as long as you are arguing on that basis, whatever it is, why shouldn't people argue on the same basis that Rome is wrong about various things? @guy fawkes I'm not sure what the "guy at the gym" has to do with anything. Also, it might depend if the guy at the gym is an Assyrian or not. You say I would be going against the Fathers, but there's probably 3 accounts in the fathers of where Peter died as far as I know. It wasn't a topic of major interest to the fathers. It was hardly de fide. It doesn't seem to have been a very strong tradition. It was a story that appeared and was passed between a few people, but not something of central teaching and importance. No I'm not Protestant, thanks for asking. Scholars are pretty sure the bones of Peter are in Rome? Hardly. According to an account, Pope Cornelius moved the bones of Peter to where they supposedly are now in around AD 251. That assumes of course that 2 centures later Cornelius knew what he was doing. Apparently this was put to the pope and: "But what does the Pope think of all this?” That was a thousand dollar question and he gave me a million dollar answer. “Well,” he confidentially answered in a hushed voice, “Father Bagatti told me personally that three years ago he went to the Pope (Pius XII) in Rome and showed him the evidence and the Pope said to him, ‘Well, we will have to make some changes, but for the time being, keep this thing quiet’.” In awe I asked also in a subdued voice, “So the Pope really believes that those are the bones of St. Peter?” “Yes,” was his answer. “The documentary evidence is there, he could not help but believe.” So apparently a pope at least thought Peter wasn't buried at Rome. The point is, where Peter died and was buried is a matter of probabilities. I might think it is 60% likely Peter died in Rome for the sake of argument. But I'm not going to become Catholic for the sake of a probability, surely. Whatever I may or may not think about the Assyrian church, it seems like I should take their tradition of what happened to Peter with some seriousness. @guy fawkes I'm not an expert on the Assyrian church, but most likely I WOULD agree with their view of the Eucharist, Saints, Mary etc. But I don't see why that is important here. The issue is that where Peter died is an open question. You saw some bones in Rome? Even the guy who found those bones wasn't convinced they were Peter's. Maybe they were, maybe they weren't. I wouldn't want to trust my eternal state to getting that question right. No you didn't die in Mexico city. However some folks said Peter DID die in Babylon. Maybe they were wrong, but maybe the folks he said he died in Rome were wrong too. And some scholars think Peter died in Jerusalem. Since that was his home town, it's not unreasonable either. @guy fawkes, yes I'm Orthodox, which should answer most of your questions. I'll try and answer the ones that seem pertinent. Was Peter singled out? I find this question rather ambiguous and difficult to answer. Was John singled out? As the "disciple who Jesus loved"? I mean Chrysostom said "For [John] the son of thunder, the beloved of Christ, the pillar of the Churches throughout the world, who holds the keys of heaven, who drank the cup of Christ, and was baptized with His baptism, who lay upon his Master's bosom with much confidence, this man comes forward to us nowÃ–. By this Apostle stand the powers from above, marveling at the beauty of his soul, and his understanding, and the bloom of that virtue by which he drew unto him Christ Himself, and obtained the grace of the Spirit. (St. John Chrysostom, First Homily on the Gospel of St. John). Certainly there was something a bit different about Peter. Not always in a good way though. He stands out as the most impetuous, with the biggest personality. Not sure that makes him a pope though. Was Peter told to feed the sheep, and strengthen the others? According to the church fathers, yes because he was the one who denied Christ and needed redemption. Was his office be one of honor only? That assumes he had a different office to the other apostles, which I don't know anything about. Certainly the bible doesn't mention any office other than presbyter, bishop and deacon. I didn't say I think Peter was 60% sure to have died at Rome. I just used that number as an example. Frankly I have no idea what the probability is, and I don't see why I should care. The data is fairly sketchy, and the church fathers don't seem to care overly for this question, so neither do I. You say the actual question is whether he presided in Rome as Pope. Well, that's only one question. Even if he did preside there as Pope, so what? He presided in Jerusalem as bishop, does that make the bishop of Jerusalem Pope? The Catholic argument is because he died there supposedly, that bishops of Rome are head of the church. There are a whole lot of hoops you must jump through before we get to that point. One of which is showing he died there. Others are proving he had an office, proving who he passed on the office to, and so on and so forth. You ask how many folks said Peter died in Babylon. How would you measure such a thing? Probably only Tertullian said Peter died in Rome, and everybody else copied him. And Tertullian we know isn’t always accurate. The question isn’t how many, the question is how accurate are the sources. That’s not easy to evaluate. At the end of the day, it’s just opinion. @guy fawkes You say: "Also, I didn't see "some bones" in Rome. I saw some bone that guys a lot smarter than me have studied and concluded they are Peter’s." Come now. I’ve read the book, “The bones of St Peter”, so I know as much as anybody about this. Under the Vatican are catacombs. There is scratched onto the wall down there “here is Peter”, and some bones were found. What does that mean? We know that Cornelius is said to have in 250AD moved the bones to where they are. In order for them to have been Peter’s, Cornelius must have been right that they were ever in Rome, they must have been preserved through those 200 years, then the following centuries, then when St Peter's was torn down and rebuilt. Then we have to assume that the bones are the ones the inscription refers to, since it is all a big vague down there. Yes they might be Peter’s. But there are a ton of IFs involved. You say: "Our job is to use our judgement, our "private judgement" and sift through the various pieces of evidence and come to a conclusion." Is it my job to decide where Peter was buried? The bible doesn’t say I have any such obligation. I just point out that there are competing opinions about where he died. Some churches say Babylon. Some scholars say Jerusalem. Prove that I should care enough to sort out this mess. You say that the Assyrian church doesn’t list Peter as founder. That’s not the point. The point is Rome’s claim to be the successor (and only successor) to Peter is that he died there. If he didn’t die there, for whatever reason, that claim goes up in smoke. I mean, Rome isn’t the only one who could claim that. "The Chair of Saint Peter at Antioch, where the disciples were first called Christians." Today's solemn feast received from our forefathers the name of Saint Peter's Chair at Antioch, because of a tradition that on this day Peter, first of the Apostles, took possession of his episcopal Chair. Fitly, therefore, do the churches observe the day of his enthronement, the right to which the Apostle received for the sake of salvation (which cometh to us in the churches,) when the Lord said : Thou art Peter, and upon this Rock I will build my Church. @guy fawkes, does Clement say such thing about Peter's death? I can't see it. I looked at what other people are saying about that, and there seems to be debate about that. I can't see it even saying that Peter even was in Rome. Maybe you can see something I can't. You ask how I can say Tertullian might be in error causing "the whole church" to follow him in error on a major point used to make a case for Petrine primacy. But that assumes up front that it is a major theological point. If Tertullian said that Paul enjoyed eating Kebabs with spicy sauce, and lots of people in the church believed him, would that be theologically infallible? Prior to Rome concocting the idea that the bishop of Rome was the unique successor to Peter holding a special office, there was no reason to think where Peter died was an especially significant theological point. It was an interesting point, but not apparently theological. And while, perhaps, the "whole church" may have accepted the idea that Peter died somewhere in the vicinity of Rome, the church will accept many things if there is no reason to doubt it, without necessarily giving it the imprimatur of infallibility. For example, if I turn up at church with an icon and a story about it, people will accept it, because why not? But it doesn't mean they give it infallibility. I mean didn't St Cyprian say, "A custom without truth is ancient error."? Or was Cyprian wrong about that? I mean look, you really have no basis for complaining about that. Look at the Roman Catholic church on the issue of Limbo, and whether the unbaptised can go to heaven. Unlike the question of where Peter died, that looks and smells like nothing but doctrine, and not long ago everyone in the Catholic church taught it. The councils of Lyons and Florence teach most clearly that nobody unbaptised can ever see the beatific vision of heaven. Unum Sanctum said nobody out of communion with the Pope can be saved. Pope Pius XII's prayer in 1958 was: "enlighten the minds wretchedly enfolded in the darkness of ignorance and sin, that they may clearly recognize the Holy, Catholic, Roman Church to be the only true Church of Jesus Christ, outside of which neither sanctity nor salvation can be found." Pope John XXIII in 1958, adhered to the traditional teaching of the Roman Catholic Church - no salvation for those not united to the Pope: "The Saviour Himself is the door of the sheepfold: "I am the door of the sheepfold." Into this fold of Jesus Christ, no man may enter unless he be led by the Sovereign Pontiff; and only if they be united to them can men be saved, for the Roman Pontiff is the Vicar of Christ and His personal representative on earth." Of course we all know that isn't what Rome teaches now. For the Orthodox, where Peter died is not doctrine. Do we assume he died in Rome? Sure. Just like we assume all sorts of stories about the saints are true. But we can doubt these stories from time to time without calling into question the fundamentals of the faith. Of course there are many things that clearly are doctrinal, and we assume are infallible teachings of the church. But where someone or other died is not one of them. Thanks for that reminder about what Cyprian wrote about "custom without truth, is an ancient error". "Nor ought custom, which had crept in among some, to prevent the truth from prevailing and conquering; for custom without truth is the antiquity of error." Even if Peter died in Rome, it does not establish any such thing as a Papacy or Pope. There is no such thing in the 27 books of the NT. Also, the earliest writings affirm that a college/plurality of elders and the office of bishop is the same office. The names of elder and bishop is interchangable in the NT and earliest writings of the early fathers. Moreover, NONE of the earliest churches had a mono-episcopate. They all had a plurality of elders at first. Ignatius (writing around 107-117 AD, ?) is the first evidence of the mono-episcopate, and seems to be where that custom/practice started. and exhorts the elders to shepherd the flock and to act as overseers. Babylon could be a metaphor for apostate Jerusalem. ( I mention this in the com box (I had forgotten I wrote that in 2013) of the other article that James Swan links to, that he wrote back in 2006, quoting lots of scholars and commentaries that Babylon is the Babylon of Mesopotamia/ modern Iraq). It seems that Ireneaus, Tertullian, Hegessipus, and Eusebius are reading a mono-episcopate office back into the first century by their "bishops list" of only one bishop appointed by Peter or other apostles in other areas. The big question for me is how strong is the tradition that both Peter and Paul were executed by Nero around 67 AD in Rome, Peter by being crucified upside down, and Paul by being beheaded. John and I have debated before here and I think at some other comboxes and / or chat-rooms. All those other disagreements don't really matter compared to our agreement that the Papacy is not Biblical nor historical. The Eastern Orthodox are a shining ancient example of the problems of the 1870 Papal claim of jurisdictiona and infallibility as "bishop of bishops". Another area of disagreement of east vs. west is that the east is against Augustine's interpretation of Romans 5:12 - "that all sinned in Adam" (original guilt in Adam imputed to the whole human race) - the EO agrees with original corruption (the sinful nature being passed down from our parents), but not with original guilt. Just to let you know James your series was posted at Free Republic (one , two and three ) in response to DV's article "Why Catholicism Is Preferable to Protestantism" on CA based upon his TPD, and which i responded to here . Thanks be to God for His grace and Truth.